A city of castles and cliffs (and coffee! 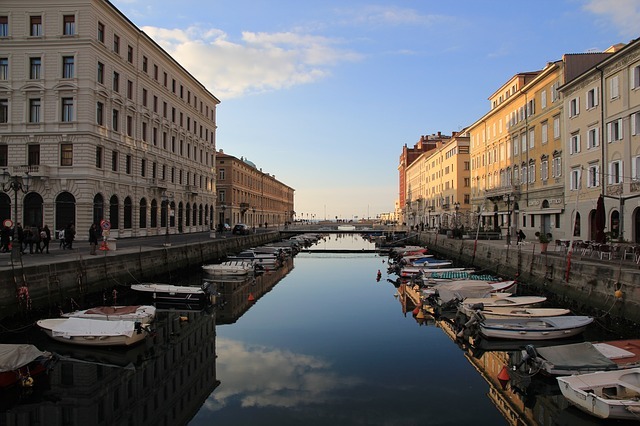 ), forged by a mix of Roman, Venetian and central European powers, Trieste is Italy’s cosmopolitan outpost in the east. Gaia Zol is our insider guide. Trieste’s charm is in the city’s countless guises. It stands as the last Italian rampart in the far east of the country, closer to Ljubljana than to Rome. The city guards the Adriatic coast from the limestone cliffs of the Karst Plateau, where geological features are as varied as the people and their languages. The Venetian influence comes from the short occupation by the Republic of Venice in the 14th century. The German comes from the dominion of the Habsburgs, the leaders of the Austrian Hungarian Empire, throughout the 15th century and later in the 18th. The Slovene influence comes from the Yugoslav occupation after World War II – the two populations have always intertwined, sometimes peacefully others less so, such as the forced “italianization” of the region after the Great War. Trieste’s architecture is a living testimony to its past. The Austrian Neoclassical and Baroque styles merge with the medieval elegance of the Old City. The St. Justus Cathedral marks the influence of the Italian Renaissance, while the Synagogue speaks of Trieste’s multiculturalism, both historical and current. Foreigners represent 9.5 percent of the population. Most are from Italy’s neighbouring countries, with Serbs as the largest demographic, but there is also the tiny 0.01 percent from Saudi Arabia. Today everyone can feel welcome. 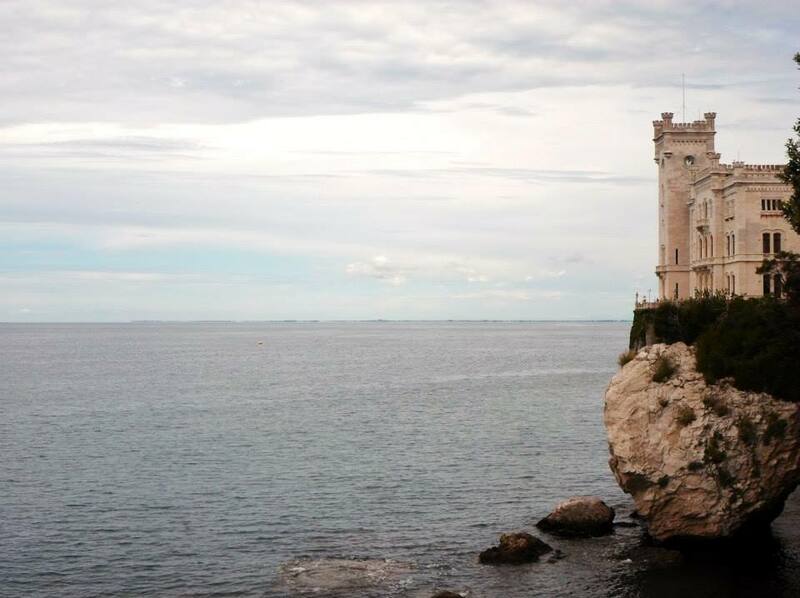 The Miramare Castle overlooks the Mediterranean from a large white rocky promontory, so you can’t miss it. The 54 acres of the park envelop the residence of Emperor Maximilian I and Empress Carlota of Mexico, who commissioned architect Carl Junker in 1856 for the undertaking. Miramare is a mix of styles: Chinese drawing rooms alternate with paintings by Cesare Dell’Acqua After a stroll around the park with its French gardens, English structures and the exotic species of plants, it is time to head back to town thanks to the pedestrian lungomare. The Unity of Italy Square faces the gulf of Trieste – the sea is your constant companion. Built during the ruling of the Austro-Hungarian empire, the piazza has been an important gathering point for centuries. The square is framed by public buildings, such as the municipality, and by coffee stores. At its centre stands the Fountain of the Four Continents, representing the city kissed by luck together with a depiction of the world’s great land masses (as known in the 18th century). Only a 15 minute walk away stands the Cathedral, consecrated in 1385 with a mosaic covering the floor. Outside the Roman church, Roman ruins remind one of Trieste’s ancient past. To jump to the modern era and to go back towards the Mediterranean, the Revoltella Museum is the stop for art buffs. Works by painters such as Giorgio de Chirico and Francesco Hayez fill the halls of the three buildings that once belonged to Trieste’s aristocracy. The Foibe of Basovizza informs our understanding of both Trieste’s, and Italy’s, past. In the heights of the Karst Plateau, this sinkhole represents a great tragedy for the city. Between 1943 and 1945, the Yugoslav army performed mass executions on the local Italian populace, discarding their bodies in the gully. While fascism was crumbling and Tito’s grip of Yugoslavia strengthened, in Trieste people died for being in between two countries. After getting a sense of the city’s darkest hour, it is time to lighten the mood with a taste of its foodie delights by the Adriatic Sea. The Mercato Coperto (Indoors Market) is a delight for the locals as much as it is for visitors. Inside the warehouse, rows of fresh produce such as vegetables, fruit and flowers line the tables while the vendors in aprons serve the customers – and yell their prices. Outside, the market looks like a ship ready to sail – perhaps underneath the Rilke Trail. After the history and the food, the Rilke Trail is the perfect way to digest it all. The trail leads hikers on an easy walk through the Nature Reserve of the Falesie with stunning views on the gulf and a glimpse of Duino Castle at the end of the sentiero. With a mix of Mediterranean maquis and Karst mountain forest, the trail is a taste of Trieste’s flora and its diversity. Trieste is the city of coffee and visitors don’t need a tour guide to indulge in caffeinated pleasures. First sip: Illy Caffè, founded in 1933. The Coffee University organises a tour of the factory (which isn’t open to the public), offering degustations and a course on coffee. The participation fee is €390, so not for all budgets. On the other hand, the Caffè degli Specchi (mirrors) is a cheaper alternative, right in the heart of downtown since 1839. The facade recalls the Austrian architecture, while mirrors line the walls of the inside. Just as historic is the Caffé San Marco which has been brewing since 1914. The cafè was destroyed during World War I and almost a century later, in 2013, a public campaign saved it from closure. One more sip of espresso and it is time for a half-day sailing excursion. From the port of Trieste, private boats take visitors around the gulf. 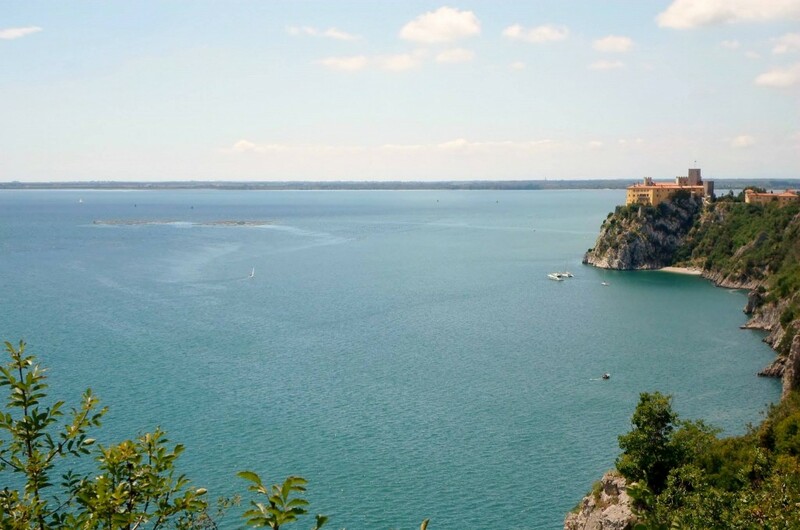 The typical itinerary includes Duino Castle, The Cliff of the White Lady and Miramare offering a breezy alternative to a hike along the Rilke Trail. Those who suffer from seasickness might prefer Discover Friuli’s Foods and Wines of the Carso experience. The tour takes foodie buffs through vineyards, to wineries and cheese-producing farms – the perfect prelude to another espresso. The luxurious Savoia Excelsior Palace faces the gulf and visitors can enjoy the sound of the waves from the massage room, sauna and the library. Thanks to their pillow menu, everyone is guaranteed a good night’s sleep. Close to the Parco di San Giovanni, the Villa Bottacin offers calm a few steps from the busy Unity of Italy Square. The terrace doesn’t just offer a quiet spot for breakfast, but a heated swimming pool to cool off. B&B Alla Casa Sconta offers a home away from home, with a well-tended garden, a pet friendly environment and homemade breakfast. The B&B doesn’t have a spa or sauna, but it doesn’t need it: the quality-price value matters the most. Influences from Serbia, from Hungary, Italy and neighbouring Austria all have left an indelible mark on the city’s cuisine. Once more, the city speaks many languages. Some common dishes you might find on your menu include: Branzino cooked in the oven with a shake of mussels, shrimps and clams; gnocchi of plums with potatoes, eggs and cinnamon; and cevapcici, grilled meatballs full of spices. For dessert, Trieste recommends pinza or the strucolo. 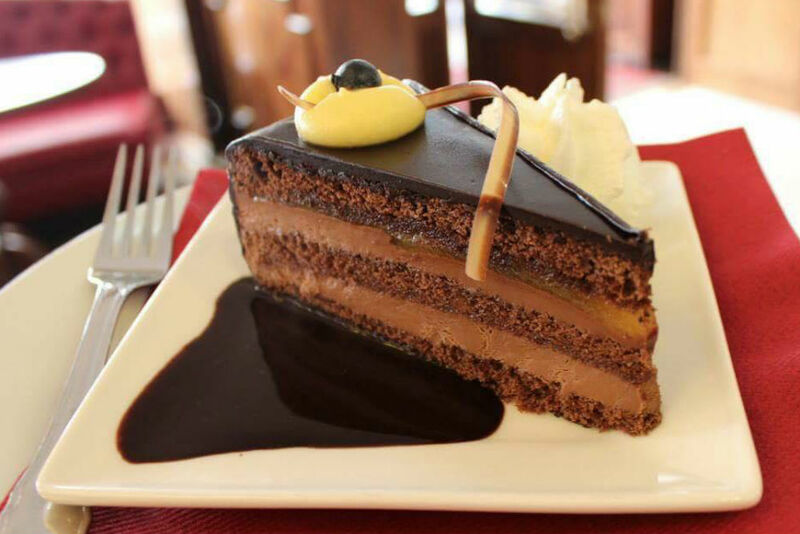 Restaurants-wise and Osteria Istriano di Giobi e Oxa blends Istrian and Italian cuisine with plates such as swordfish carpaccio, lasagna with fillets of sea bream and tuna steak. The Bagutta Triestino offers bresaola, breaded gnocchi with goulash, and ljubljanska (fried stuffed meat from Slovenia). All washed down with fantastic wines, of course. The day starts with an espresso and goes on with a corretto (coffee with a splash of grappa), whilst aperitivo hour starts before dinner. The daylight calm of Unity of Italy Square gives way to a party atmosphere at night, when spritz aperol with gingerino is the drink of choice. And if you have enough of those the evening invariably ends at the club. Recommended venues include Mastrobirraio, which offers a selection of local and international craft beers that change regularly. Close to downtown, but hidden in a side street, had helped it maintain an air of authenticity. 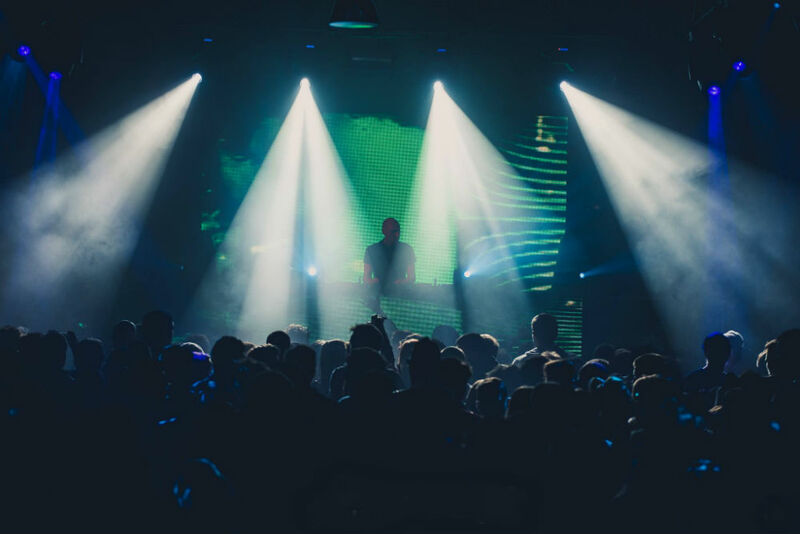 Meanwhile Helpiscoming offers live music, cocktails, international house DJs and the all-important blinking lights: this nightclub is Trieste’s go-to place for party beats. By plane, the closest airports are Venice Marco Polo and Rochi dei Legionari. Every major airline lands in Venice, as do several low cost carriers such as JetBlue. However, Trieste is easily reachable by train. Take the Eurostar and Trenitalia stop at Trieste Centrale, the main hub. It is a two hour ride from Venice Santa Lucia. Useful websites are: The FVG Tourism Board for official information about the city and the region Friuli Venezia Giulia. Il Piccolo for local news and events. The Welcome Office for an overview of the city and region. Unfortunately, few guides deal with Trieste or Friuli Venezia Giulia. To get a grasp of the city, start with The Rough Guide Snapshot Italy: Friuli-Venezia Giulia. Another useful guidebook is Eyewitness Travel Family Guide Italy: Venice & Northeast Italy. More reading that portrays Trieste’s atmosphere include Trieste and the Meaning of Nowhere by Jan Morris about the history of the city and its shades, whilst those interested in Joyce’s time in Trieste might enjoy this account of his Triestine Itineraries. One last recommended reading is A Ghost in Trieste by Joseph Cary, a book about the author’s travels. Movies set in Trieste include: Sleeping Car To Trieste and Follow Your Heart by the Italian director Cristina Comencini. I have also been to Trieste this weekend, I liked the architecture and the sea very much. And of course the italian lifestyle and food, dolce vita.